10ft stable sit on top for touring, fishing and famuly fun. Very comfortable to paddling with adjustable footrests and the adjustable padded seat/backrest system. Popular 12ft sit on top for touring and kayak fishing. Available in two specifications: Standard and Angler. Below is a list of models we are able to special order. Please call us on 01925 818437 for more information. This compact, sub 12-footer has everything rec kayaks, anglers and hobbyists dream about: massive capacity and storage, versatile performance and rock-solid stability. The Ride 135 is optimized for maximum performance and capacity from flat to surf to small water, while adding the latest Wilderness Systems innovations paddlers, hunters, kayak fisherman and other hobbyists demand. The Ride 115x has the same stability, maneuverability, and capacity -but now with the "wish list" of features just for anglers. Easy handling and maneuverability with great stability, the Aspire 100 is sized perfectly to fit a female or small-framed paddler comfortably. If you are looking for a Wilderness Systems Sit On Top Kayak or a Wilderness Systems Touring Kayak that is not listed, please contact us as for current pricing and availability. 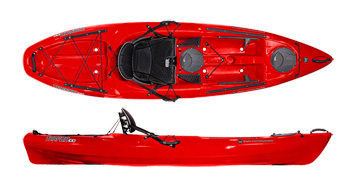 We have regular deliveries from Wilderness Systems and can supply their entire range of kayaks.